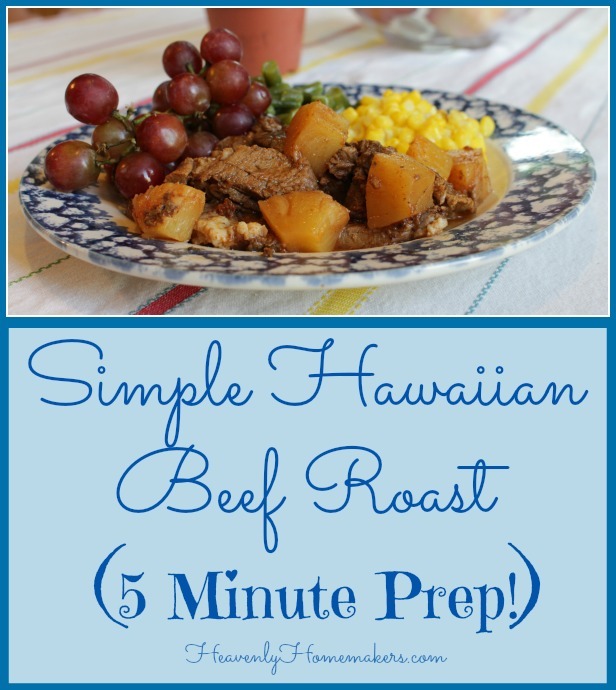 I first attempted this Simple Hawaiian Beef Roast recipe about a month ago on a busy night in which I was feeding out of town guests who had come to watch our youngest son, Malachi, perform in our local Children’s Theater production. Malachi is the first of all our kids to choose to be involved in theater. It is a gross understatement to say that before this summer, I knew nothing about being a theater mom. I kept calling the costumes “uniforms” because I have been a sports mom for so many, many years. But more difficult than this is the fact that I volunteered to help create said costumes. What in the world was I thinking? Well, I’ll tell you what I was thinking. I was thinking that since all parents needed to be involved in some way with helping to pull off a huge 50-kid theater production, volunteering to help with costumes would be a better choice for me than volunteering to put on stage make-up. No way, no how should I be allowed to attempt to paint a child’s face. I wanted to exit back stage left. Please someone tell me where I can sign up to bake cookies!!! Deliver me from trying to understand how to put together uniforms! I mean costumes. As it turned out, the other moms did a marvelous job creating fabulously impressive costumes. The make-up moms transformed kids’ faces so that they actually looked like daisies and rabbits and mice. In the meantime, I used my talent to write actors’ names on Wal-mart bags with a sharpie so we could keep track of each character’s gloves, socks, and shoes. Rock on. So this roast recipe. 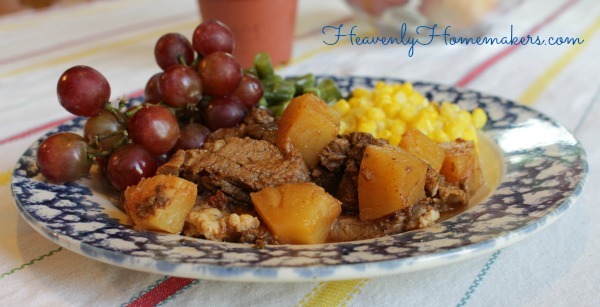 It’s so simple you can throw it into the crock pot to cook all day without exerting any effort. You can set out plates and direct your guests to help themselves to the roast as you head out the door to go help 30 sweet girl actors between the ages of 7-17 don their hedgehog, cook, queen, and daisy costumes as you pretend with all your might that you actually know what you’re doing. Pour barbecue sauce over the top. Cook on low for 10 hours if roast is frozen and 8 hours is roast is thawed.